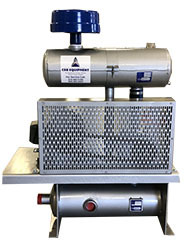 C & B Equipment takes great pride in its diversified product line for both low pressure and vacuum applications. All of the manufacturers we represent can provide individual units or factory engineered packages to meet our customers needs. Packaged systems simplify the installation for the end user by requiring only electrical and mechanical connections. We even take the packaged units one step further by offering customized units. Many customers have facilities that are limited on space, or have specific equipment design requirements that do not make it cost effective for the factory to accommodate. In those cases our sales engineers can will utilize CAD technology to custom design a competitively priced packaged unit to meet your individual requirements. If necessary, we will make onsite visits to determine the exact requirements of the application. In the end, you get a product that fits your design criteria and makes sense for your facility.